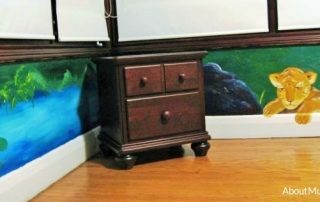 This mural will sweep your kids away to an enchanted land. Painted in Grimsby, a giraffe, lion, flamingo and butterflies play in a lagoon and under a tree. 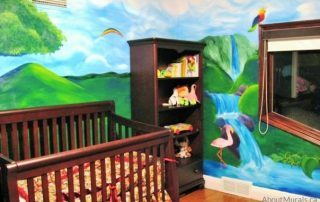 Farrah’s dad wanted to create a bedroom that inspired imagination. He wanted her to grow up respecting animals and loving nature. Farrah’s dad wanted to make a statement with this wall mural. He wanted every square inch of all four walls painted with artist grade acrylic paint. I painted the blue sky, green grass, lagoon and mountains before adding the animals. 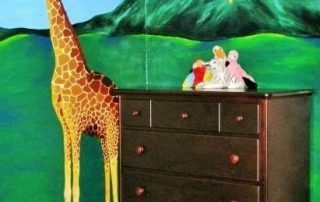 In this mural, I painted a tall giraffe to give the room some height. I love doing this in my wall murals. 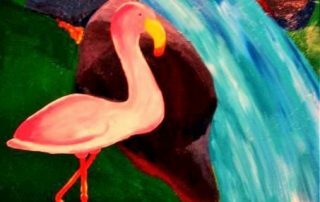 The baby lion and the flamingo in the lagoon were painted close to the ground so Farrah would have someone to pet and play with. 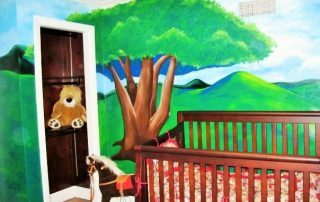 The tree in the wall mural was painted over her crib to give her something to look at during nap time. Pretty butterflies add that splash of pretty, girling it up a bit. Wall murals from $350. This mural starting from $2050.